Occasionally the built-in names for Ribbon tabs need to be changed. Using the Ribbon Workbench for CRM2011 makes this very easy. 1. Create a solution with the entity you want to change. 2. 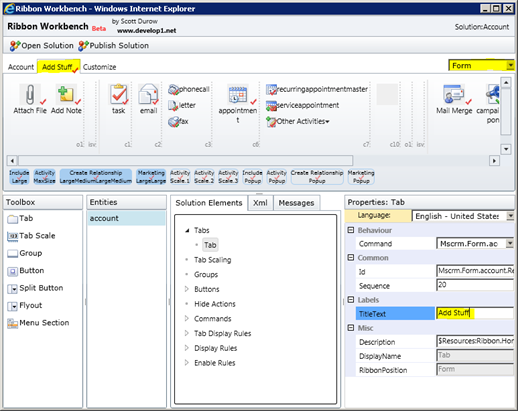 Open the Ribbon Workbench for CRM2011 and select your solution. 3. Find the tab you want to change. If you want to customise the Form Tabs, you'll need to select the 'Form' value in the drop down in the top right. 4. Select the 'Add' tab and use the 'right click' menu to 'Customise Tab'. This will mark each element within the tab as customised so you are free to rename/edit/add to. If you find an issue with the Ribbon Workbench for Dynamics CRM 2011 or have any suggestions,please send it here.